VERY RARE - WE HAVE TWO. Their mission: destroy the enemy squadrons massed at the Southeast Asian headquarters of the Japanese Air Force in Chiang Mai, Thailand, before they have a chance to get off the ground. The very survival of this famous group of American volunteers known as Chennault’s Flying Tigers, depended on the success of this extremely dangerous low-level strafing mission. In less than 10 minutes, this intrepid band so incapacitated the enemy forces at Chiang Mai, that it became one of the AVG’s most memorable raids. The painting By the Dawn’s Early Light was completed in 1996. 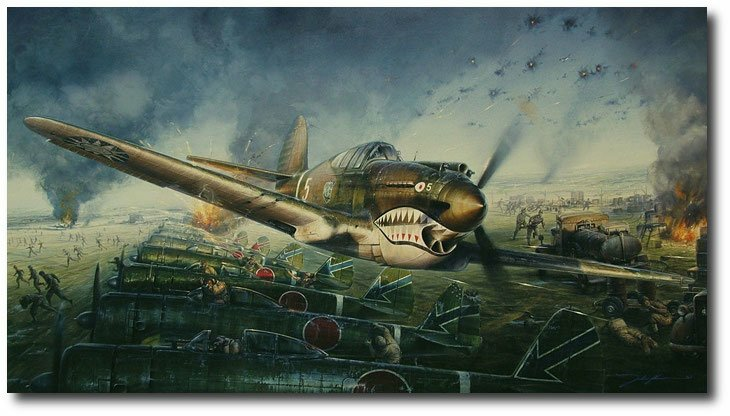 The artist worked painstakingly with AVG pilot Charles R. Bond to recreate this dramatic moment in his second of a series of Flying Tigers scenes. This was the second in a series of Flying Tigers scenes by John Shaw, the first painted a year earlier, entitled American Volunteer Group in China. In Dallas Texas of ’96, a large group of AVG veterans gathered to sign the lithograph edition. The following day, these men and family members of AVG who had passed on were recognized by the US Air Force, as official American combat veterans for the first time. Air Force Chief of Staff Ronald Fogelman awarded all AVG pilots (or a family representative) the Distinguished Flying Cross, and all AVG support personnel the Bronze Star.